Is it economically viable to fund a smoking cessation program specifically for patients with Crohn’s disease? 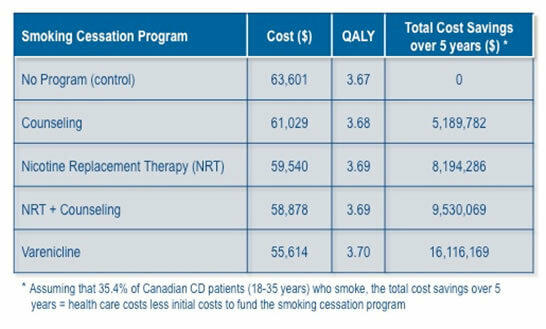 YES, it is economically viable to fund a smoking cessation program for CD patients. Savings are realized after only 5 years. A cost utility analysis was conducted using data from the Albertan and Canadian health care system over a 5-year period. Five scenarios were compared (Table 1). Patients included were smokers aged 15-35 years, who received prednisone and azathioprine (AZA) to induce remission followed by AZA for maintenance, and were naïve to both anti-TNFs and intestinal resection. The following health states were considered in the Markhov model: medical remission (AZA or anti-TNF therapy), dose escalation of anti-TNF, transition to a second anti-TNF, CD-related surgery, and death. All probabilities for smoking cessation and health state changes were obtained from the literature; costs (CDN $) were based upon the Canadian/Albertan medical procedure and drug costs. The primary outcome, cost per quality-adjusted life year (QALY), was superior to No Program for the 4 experimental scenarios (Table 1). Additional analyses (three-way sensitivity, probabilistic sensitivity analysis, and budget impact analysis) each identified that the No Program scenario was the least cost effective of all. The summary and conclusion in this issue of E-mentoring in IBD pertains to the manuscript(s) being reviewed, and should be considered in the context of what is already known surrounding the topic and incorporated into practice as deemed appropriate by the individual learner.